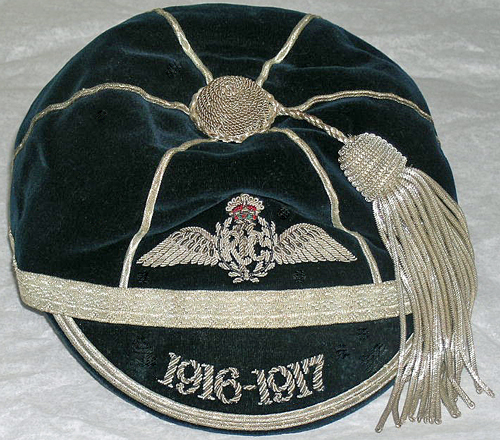 Debbie Mason, collections manager at the World Rugby Museum, Twickenham, had been researching to try to find information about a rugby cap which will be exhibited when the museum at the famous London stadium re-opens in 2018. The cap is a Royal Flying Corps cap from 1916/17. There is a handwritten note on the label to say it belonged to Lieutenant G.B.Walker. Research took her to an article on the Helensburgh Heritage Trust website. That came about because John Stepney, from Worthing in West Sussex, who was on holiday in the highland capital and found the picture of a young officer, wanted to find out who it was. The clues were that on the back of the picture was written Uncle George, and it was taken by W.D.Brown of West Bay Studio, Helensburgh, a prolific local photographic business. 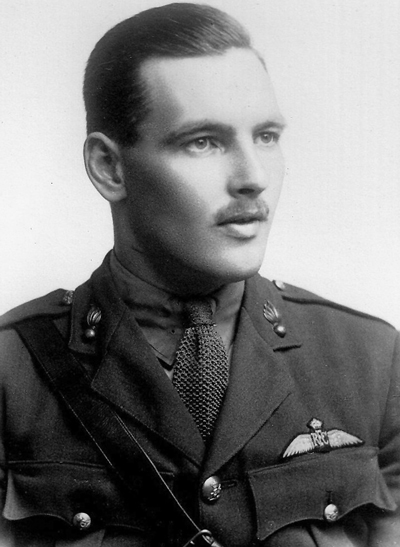 The uniform is that of the Royal Flying Corps before it became the Royal Air Force in 1918, and the collar badges suggested the Royal Artillery. Many Army officers were seconded to the RFC. A search of the excellent Commonwealth War Graves website led John closer to an identification. 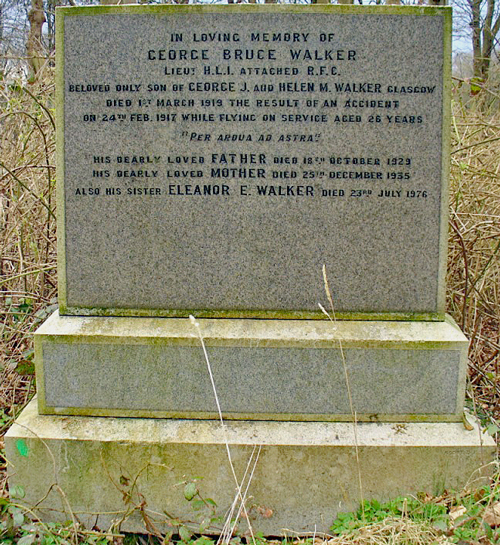 It recorded that Lieutenant George Bruce Walker of D Company, 17th Highland Light Infantry and the RAF, died on March 1 1919 and that he was buried at Cathcart. He was the son of chartered accountant George John Walker and his wife Helen Mary, nee Porteous, who married on June 23 1891 at their then home, 7 Campside Crescent, Langside, Cathcart. He was 38 and she was 32. His father was present at the birth on Christmas Day 1892, and young George was baptised and confirmed at St Ninian’s Church in Pollokshields. Mr and Mrs Walker moved to Roddam, Newlands Road, Newlands, where their daughter Eleanor Elizabeth was born on June 5 1901. Later the family moved again, this time to Elmtree Villa, 19 Suffolk Street, Helensburgh, where they lived at the time of their son's death. The young officer’s death certificate showed that he died at Garnet Bank, 37 Campbell Street, Helensburgh, from the effects of a fractured spine. The certificate also indicated that the former rugby player had been paraplegic for two years. It described him as an apprentice chartered accountant. What happened to him was revealed in a brief report in the Helensburgh and Gareloch Times a week after his death. George, who was serving with a training squadron, 26 Reserve Squadron RFC, based at Turnhouse, near Edinburgh, then an operational aerodrome and training centre, was injured in a serious accident. He was flying a Maurice Farman Shorthorn aircraft (pictured left), the main training workhorse of the RFC, near his base on February 24 1917, when his machine nose-dived to the ground, but that was not reported at the time. The casualty record card stated that it was a flying accident and was considered to be an error of judgement while landing. He was confined to bed for two years as a result of the very serious injuries to his spine he received in the accident, and which ultimately caused his death at his Helensburgh home. His father was present when he passed away. The funeral was held in Glasgow, and he was buried at Cathcart Cemetery. His name is on the St Ninian’s War Memorial in Pollokshields. Soon after his parents left the burgh and moved to Hillhead, where his father died on October 18 1929 at the age of 76 and his widow Helen died on Christmas Day 1935 at the age of 77. George’s sister Eleanor never married, and outlived her brother by 57 years. She passed away aged 75 in Cupar, Fife, on July 23 1976. W.D.Brown & Co., Photographers and Miniature Painters, of West Bay Studio, 109 West Clyde Street, specialised in ‘Artistic Portraiture at moderate prices’, including ‘Child Studies’. Later it became M. & J.Brown. Debbie, who will reunite the cap with his story, said: “I’m afraid we don’t know much about the cap at all. It is one of many items that were acquired by the Rugby Football Union before they started keeping documentation on provenance. “I don’t have any information as to how the cap came into our collection. “It will be displayed in our new permanent galleries on rugby and wartime, and although we did know the name of the owner we didn’t have any information on him apart from the fact he died in 1919.